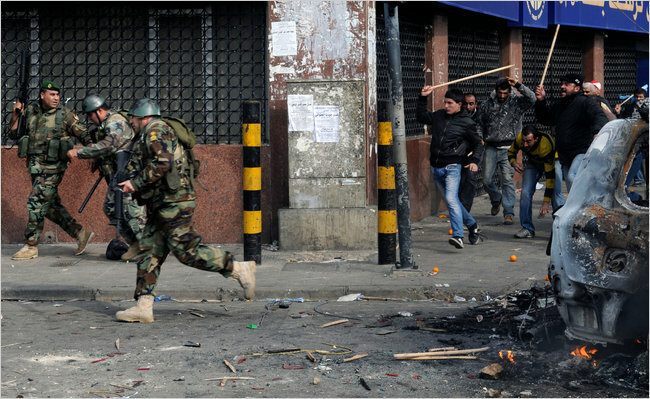 Is Lebanon Turning Into A Military State? There were days when the director of the General Security wasn’t an officer. There were days when even the presence of a General as a democratically elected president would be criticized. These days are over. Though Lebanese tend to forget that quickly, political inheritance is not the only thing we have in common with the neighboring Arab countries. We also have ruling generals. True, the Arab spring was made to prevent Jamal Mubarak and Seif El Islam Gaddafi of inheriting power, but it was also Colonel Gaddafi and General Mubarak that were the targets. In the same way the Lebanese don’t view the election of the same families to the parliament as a wrong matter, they don’t view the presence of Generals in power as a bad thing. Article 49 in the constitution prohibits the commander-in-chief of the army of being a president (unless he’s elected two years after he resigns) for a reason. However the constitution was amended several times in Lebanon’s history to let Grade One civil servants serve as Presidents. But for a coup to succeed in Lebanon, with all the sectarianism and without splitting the army in two armies (or ten, or twenty), it would likely take three centuries. So the main problem of having generals in power isn’t primarily because of a possible coup, but rather because of the nature of the Lebanese system. I’ll make it clearer. 1) If the officer slightly sides with A, he might get a favor from A. If he sides with B, he might get favors from B. 2) If he stands in the middle, stops the fighting, without actually hunting the armed men down, he gets praised by A and B. 3) If he stands in the middle, stops the fighting and hunts every armed man down, he gets vetoed by A and B. The “Amn Bel Taradi – الامن بالتراضي”, or consensual security, the fact of stopping the fighting between A and B without actually disarming A and B and punishing them for the instability they are causing, is mainly due to the fact of having officers in power. As you can see, Scenario 3 is missing, not because it’s too good to be true, but because officers in Lebanon made it to top posts due to the scenarios 1 and 2. So why would an officer risk his career by going for scenario 3 while he can get easily rewarded and have all the glory he wants via scenarios 1 and 2? Even when he has the political approval from everyone to go for scenario 3, Scenario 2 for an officer stays the preferred scenario, because it doesn’t get him too much problems. The battles between Jabal Mohsen and Bab El Tabbaneh are a perfect example. 1) stop a fight by standing in the middle. 2) But the fighting resumes, and it’s a more brutal battle, because the fighters know there is no punishment. 3) Stand in the middle again and stop the bigger fight. 4) Repeat step 2 and 3 several times. Eventually, it’ll be too big to control and it will be more than a small local battle. It’s not the fault of the army, and I’m not saying the work some officers are doing in power is bad. Fouad Chehab delayed the civil war 17 years, and Michel Suleiman is probably doing the same thing. But when Generals are democratically given power, it’s for the purpose of keeping things under control. However what happens next is an instability due to the scenario 2 – الامن بالتراضي – that will eventually lead to a total loss of control. In a nutshell, by bringing neutral generals to power, you think you are doing good, but the scenario 2 – and its consequence, consensual security – will begin, and in order to solve it, you bring more neutral generals to power making things even worse. Very well informed blog, keep the good posts coming. Let me add also, another thing that worries me more about the involvement of generals in politics, is their general lack of political, social and economical vision. Lebanon is in fact turning into a military state, the fact that our police force, has to wear urban camouflage and casually walks around in AR-15s is military state slapping us in the face.